If we are in a boxing match, Fat in one corner, and Lungs in another, Fat wins every time. Fat takes up the chest room Lungs need to expand and for lung patients, fat compromises our ability to breathe. The fat v lungs slammed home to me a couple weeks ago when a granddaughter, taking a new class on her way to becoming an RN, told me she just learned that each pound of excess fat is fed by SEVEN MILES of blood vessels. 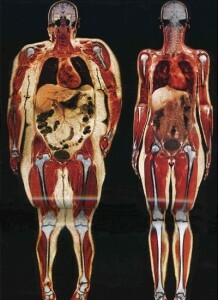 I went online that night and found an airport-scanned photo (Digg) of a 250-pound woman next to a 120-pound woman. Fat filled her stomach and chest crowding her lungs and heart. Heaven knows what all that fat is doing as it surrounds and crowds the kidneys, bladder and other organs….it cannot be good! Look, fellow Tubby’ettes and join me. To date, I have lost 133 miles of excess blood vessels supporting nineteen pounds of excess fat. Regular Tubby’ettes is lucky if their health is not yet compromised. 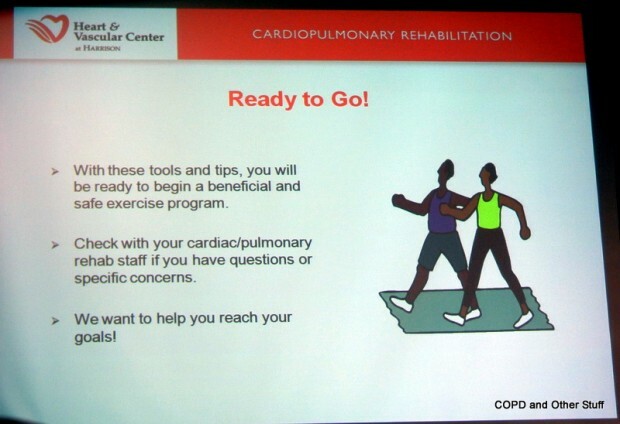 Lung patients, easing the fat surrounding our lungs will not change the PFT numbers, but we are bound to feel a sigh of relief from our lungs as the fat around them retreats and they can finally expand to capacity and add to our quality of life.